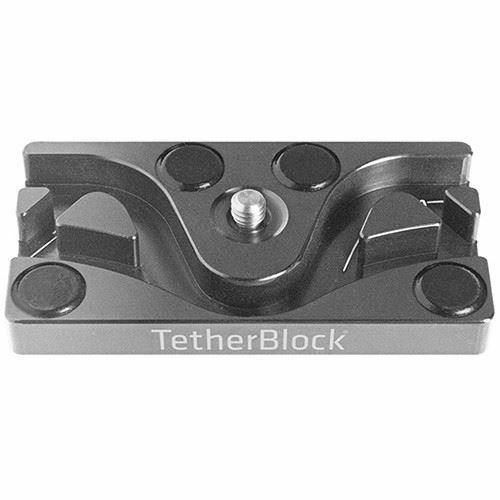 The MC Multi Cable Mounting Plate from TetherBLOCK is designed to prevent accidental removal of a cable from your camera's data ports, therefore preventing damage to the port and to your camera. By snaking a USB or FireWire, or HDMI cable through the TetherBLOCK's S-channel and attaching the TetherBLOCK to your camera's tripod mount you'll be able to shoot tethered to a computer without fear that a trip over the cable will damage the camera's sensitive data ports. This second version of the mounting plate replaces the TetherBLOCK Slim, and adds a third channel for thick heavy duty cables as well as thin and medium sized cables. It has both a 1/4"-20 and a 3/8" tripod thread mount, allowing it to be mounted directly onto a tripod head. A 1/4"-20 slotted screw attaches the plate to the camera, and can be tightened with a coin. On the bottom of the plate are two 1/4"-20 threaded holes for adding accessories like microphones or video monitors. Prevents camera damage and lost images by ensuring data cables do not get accidentally pulled out of camera. Fits camera's tripod mount via either a 1/4"-20 or 3/8" thread mount. Multiple channels accept FireWire, USB and HDMI cables. Non-slip friction pads prevent camera twist. Box Dimensions (LxWxH) 6.6 x 3.4 x 1.1"